John Brennan says anti-terror strikes are used only to stop attacks on U.S.
CIA Director-designate John Brennan strongly defended anti-terror attacks by unmanned drones Thursday under close questioning at a protest-disrupted confirmation hearing. On a second controversial topic, he said that after years of reading classified intelligence reports he still does not know if waterboarding has yielded useful information. 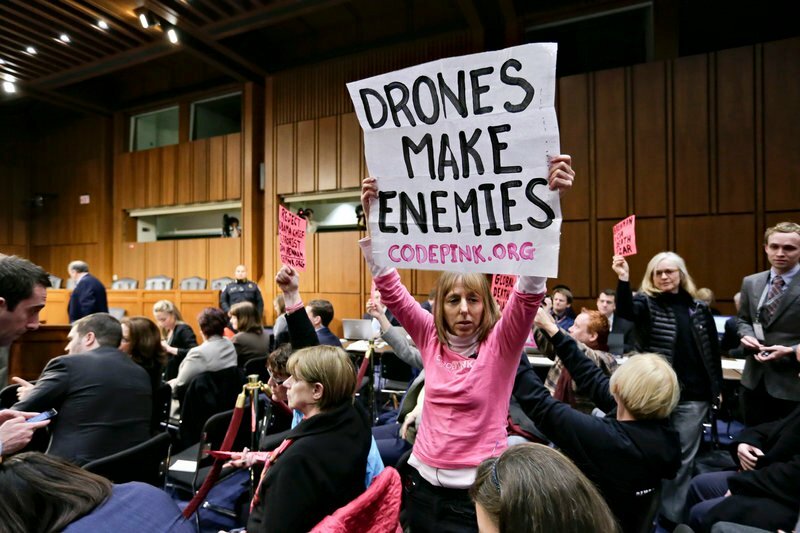 Protesters opposed to drone strikes by the CIA disrupt the start of the hearing. Referring to one American citizen killed by a drone in Yemen in 2011, he said the man, Anwar al-Alawki, had ties to at least three attacks planned or carried out on U.S. soil. They included the Fort Hood, Texas, shooting that claimed 13 lives in 2009, a failed attempt to down a Detroit-bound airliner the same year and a thwarted plot to bomb cargo planes in 2010. Speaking with uncharacteristic openness about the classified program, Feinstein said the CIA had allowed her staff to make more than 30 visits to the CIA’s Langley, Va., headquarters to monitor strikes, but that the transparency needed to be widened. 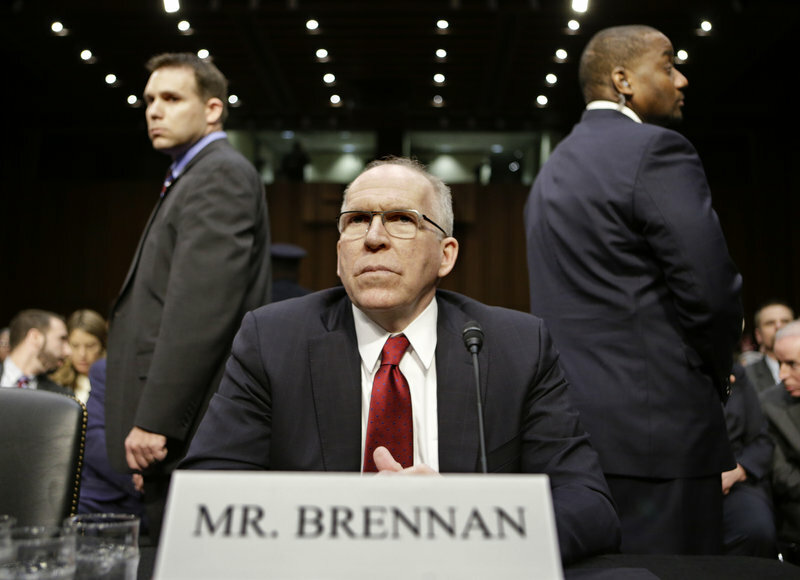 Brennan, 57, and President Obama’s top anti-terrorism aide, won praise from several members of the committee as the day’s proceedings drew to a close, a clear indication that barring an unexpected development, his confirmation as the nation’s next head of the CIA is on track. The panel will meet in closed session next week to permit discussion of classified material. Brennan bristled once during the day, when Sen. James Risch, R-Idaho, accused him of having leaked classified information in a telephone call with former government officials who were preparing to make television appearances. “I disagree with that vehemently,” the nominee shot back. Brennan made repeated general pledges to increase the flow of information to members of the Senate panel, but he was less specific when it came to individual cases. Asked at one point whether he would provide a list of countries where the CIA has used lethal authority, he replied, “It would be my intention to do everything possible” to comply. He said he had no second thoughts about having opposed a planned strike against Osama bin Laden in 1998, a few months before the bombings of two U.S. embassies. The plan was not “well-grounded,” he said, adding that other intelligence officials also recommended against proceeding. Brennan was at the CIA at the time. Brennan was questioned extensively about leaks to the media about an al-Qaida plot to detonate a new type of underwear bomb on a Western airline. He acknowledged trying to limit the damage to national security from the disclosures. On May 7 of last year, The Associated Press reported that the CIA thwarted an ambitious plot by al-Qaida’s affiliate in Yemen to destroy a U.S.-bound airliner, using a bomb with a sophisticated new design around the one-year anniversary of the killing of Osama bin Laden. The next day, the Los Angeles Times reported that the would-be bomber was cooperating with U.S. authorities. The hearing was interrupted repeatedly at its outset, including once before it had begun. Eventually, Feinstein briefly ordered the proceedings halted and the room cleared so those re-entering could be screened to block obvious protesters. Brennan is a veteran of more than three decades in intelligence work, and is currently serving as Obama’s top counter-terrorism adviser in the White House. Any thought he had of becoming CIA director four years ago vanished amid questions about the role he played at the CIA when the Bush administration approved waterboarding and other forms of “enhanced interrogation” of suspected terrorists. The shouted protests centered on CIA drone strikes that have killed three American citizens and an unknown number of foreigners overseas. It was a topic very much on the mind of the committee members who eventually will vote on Brennan’s confirmation. In the hours before the hearing began, Obama ordered that a classified paper outlining the legal rationale for striking at U.S. citizens abroad be made available for members of the House and Senate intelligence panels to read. It was an attempt to clear the way for Brennan’s approval, given hints from some lawmakers that they might hold up confirmation unless they had access to the material. Sen. Ron Wyden, D-Ore., said he was encouraged when Obama called him to inform him of his decision. But he said that when he went to read the material he became concerned the Department of Justice “is not following through” on the presidential commitment. Prodded to look into the matter, Brennan said he would. Fewer than 50 drone attacks took place during the Bush administration, while more than 360 strikes have been launched under Obama, according to the website The Long War Journal, which tracks the operations.